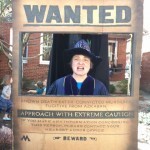 Harry Potter Halloween in Scottsville, VA.
Nestled on the James River in one of the most beautiful parts of central Virginia, the tiny town of Scottsville has been throwing a Halloween bash every year for the past three. Today was the first time I went. 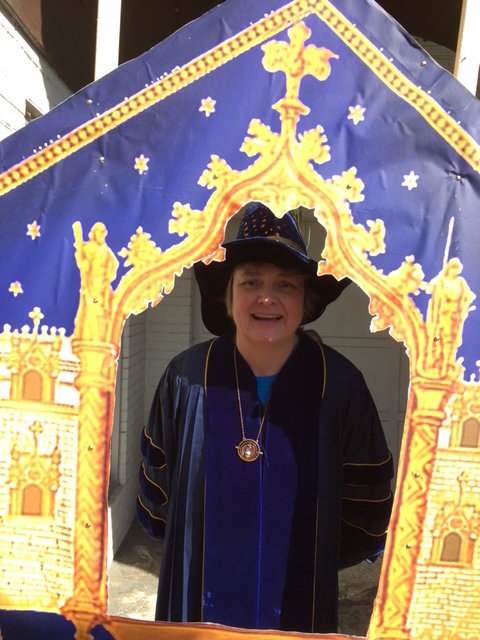 No Quidditch, no scholarly content (note to organizers– I am available for public talks at very reasonable prices— just buy me a butterbeer!) 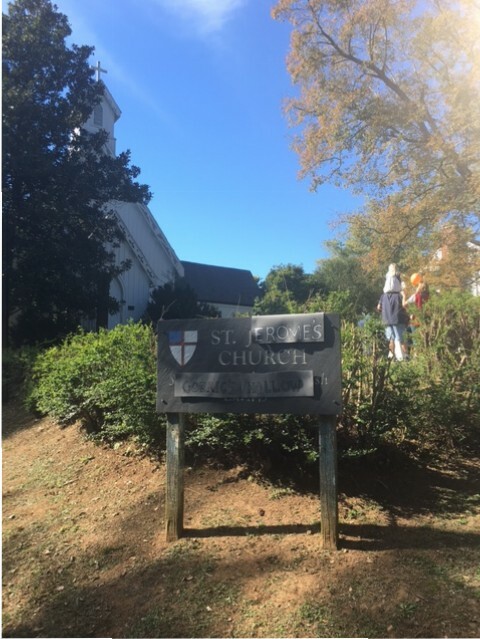 but it was a great venue for a perfect fall festival. This party was orders of magnitude smaller than Chestnut Hill’s annual extravaganza but had a lot of the same elements of both that festival, and last summer’s first (and almost certainly annual) block party in Staunton VA: local businesses transfiguring themselves into Hogsmeade and Diagon Alley establishments like Honeydukes and Ollivander’s, lots of homemade and commercial Potter merchandise for sale, activities for the kids, elaborately decorated spots for selfies (I couldn’t decide whether the Chocolate Frog card or the Azkaban wanted poster was my favorite!) 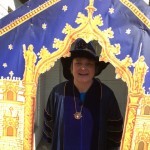 and lots of costumed characters of all ages. My favorite was a dog in full Harry attire, although the Gilderoy Lockhart who appeared at the local library was also great, and threw himself into the role. The lines for candy, butterbeer and wands were long, but otherwise things were pretty manageable, and there were big fields available for parking. This festival, for now, is in no danger of outgrowing its space, unlike Chestnut Hill, which was recently compared to Woodstock. I love the way they adapted their sign! 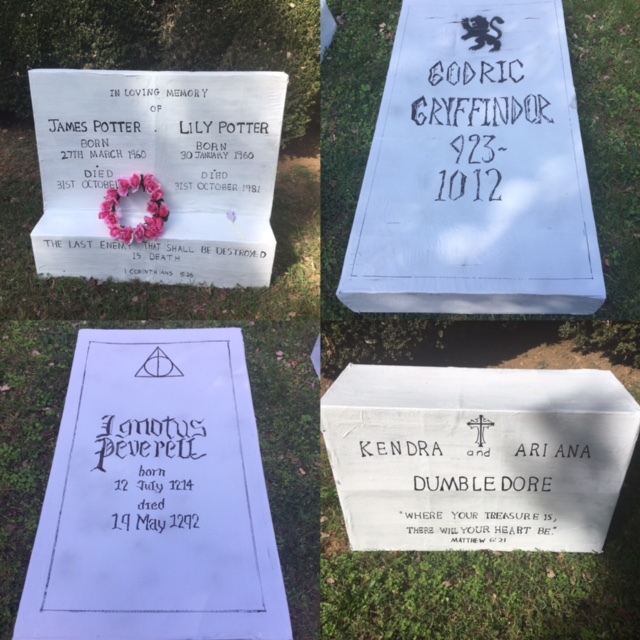 Hollow cemetery, complete with gravestones matching the book descriptions perfectly, from the wreath of roses Hermione conjured up for James and Lily’s headstone, to the Deathly Hallows symbol on the Peverell grave, to the scripture verses on the Dumbledore and Potter stones. All we needed was a coating of snow and some light shining through jewel-toned stained glass windows, but I guess it’s the wrong time of year for that. In any case, it was a peaceful detour to the tranquility of the books, away from the main Hogsmeade strip and its mostly-movie-inspired merchandise and costumes. This is one house of God that welcomes Harry and its message, and it alone was worth the trip. 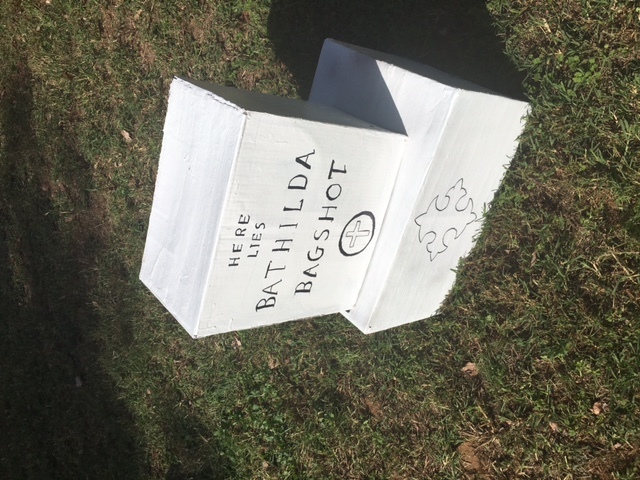 Even better, they were thoughtful enough to provide dear old Bathilda with a final resting place, which must have been a fairly messy undertaking after Nagini co-opted her decaying corpse for some rather nasty cosplay. 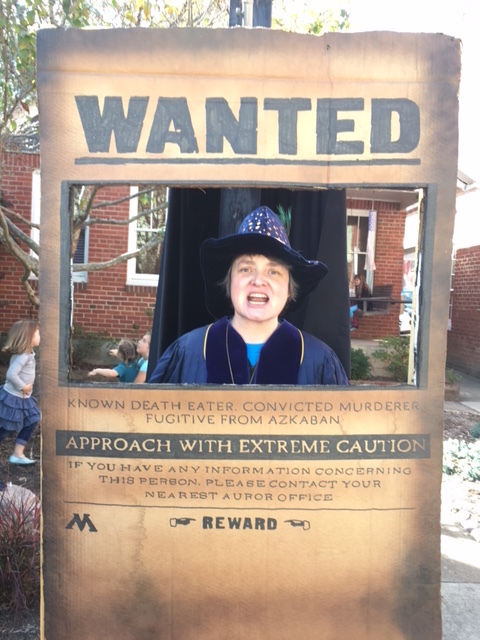 RIP, indeed, Madame Bagshot, and many thanks to the congregation of St. John’s. Thanks for the report, Louise. Sounds like fun. 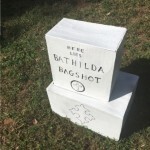 I never thought about poor Bathilda’s remains until now, but you must be right. Thanks for that… I think? I’ll be at both. Virginia is for Wizards!